New research from NASA's Cassini spacecraft's up-close Grand Finale orbits shows a surprisingly powerful and dynamic interaction of plasma waves moving from Saturn to its rings and its moon Enceladus. The observations show for the first time that the waves travel on magnetic field lines connecting Saturn directly to Enceladus. The field lines are like an electrical circuit between the two bodies, with energy flowing back and forth. Researchers converted the recording of plasma waves into a "whooshing" audio file that we can hear—in the same way a radio translates electromagnetic waves into music. In other words, Cassini detected electromagnetic waves in the audio frequency range—and on the ground, we can amplify and play those signals through a speaker. The recording time was compressed from 16 minutes to 28.5 seconds. The only message that actual 'plasma cosmology' advocates wanted to get through was that the ideas they support have real scientific merit. It's not unforgivable belief into an obviously quack pseudoscience... its the idea that mainstream science has become built upon a shaky, biased foundation that has proved to be unfalsifiable. In the smallest sense, this finding illustrates another possible energy source which can produce alternate mechanisms that more simply explain the moon's tiger stripes, 'cryovolcanoes', plumes, jets, surface heating, etc. 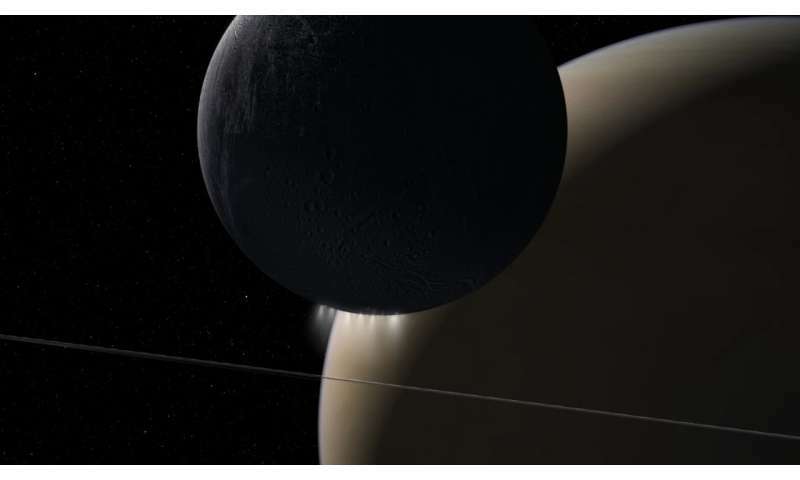 Why did it take so long to 'discover' these currents between Saturn and Enceladus? Mainstream science doesn't deny solar wind travels out to the edge of the solar system. The issue is; there is no direct current (DC) flow within the solar system coming from outside the solar system, which powers the Sun. How large does the voltage have to be outside the solar system to have a double-gap the size of the solar system? I can only figure the EU folks would question this. Never, would be the answer to that, given that we have had spacecraft buzzing around the solar system as far as the heliopause for decades, and have recently completed a two year + mission at a comet, where we find precisely nada of the nature proposed by EU wooists. This statement is a fallacy which I already addressed. How long have we had spacecrafts buzzing around Saturn and we are only now confirming the existence of an electrical circuit between Saturn and its moons? And pretty sure we've only just reached the heliospheric boundary... which led to "surprising magnetic bubbles." LOL, who's claiming this woo is real? Given jonesdumb's continued ranting from ignorance he just doesn't get it. A similar process is likely responsible for comet 67P and it's "singing". Bit by bit the standard theory is falling apart while the Electric Universe cosmology is getting more and more robust. You'd think with all the satellites we have around Earth, we would have noticed something of this DC current flow from the Sun by now, eh? Hmmm, I think I know the lead author of the paper on the 'singing comet'. Care to debate him on ISF? Given that he is qualified in plasma physics, and you aren't, expect an arse kicking. However, we all know that you'll never take your woo to an actual science site. Prove me wrong. Hey, dumbo, read the literature. Try to understand plasma physics, yes? Just like Io, Enceladus is spewing out neutrals, which become ionised (look it up), and this ionosphere is orbiting within a magnetosphere of a planet at a different velocity than the magnetosphere. What do you expect to happen? Nothing to do with any idiocy dreamed up by idiots like Thornhill, yes? By having zero sensible scientific mechanisms, and no evidence whatsoever? Yep, going well, isn't it? Lol. Keep up, 691! The current is going INTO the Sun! Still invisible and undetectable, though. If you ask the EU loons, they'll tell you that it is due to it being a 'drift current', and therefore very difficult to detect. Totally overlooking the fact that the speed of the electrons (?) are irrelevant. It is the speed with which they hit the spacecraft detectors. Which are moving at the same velocity as the spacecraft. Which is considerable, relatively. From your link: "Dr. Morley added: "Previously, drag forces from wind or thermals were thought responsible for this mode of dispersal, but we show that electric fields, at strengths found in the atmosphere, can trigger ballooning and provide lift in the absence of any air movement. This means that electric fields as well as drag could provide the forces needed for spider ballooning dispersal in nature." "...a global electric circuit that is always present in the atmosphere..."
Hmm atmospheric electric circuits. Can this be? Just wondering. Could that "singing" be compared to the old telegraph wires in the old mid and western parts of the US in the late 1800s. The Native-Americans of the time said that the telegraph wires were singing. "You'd think with all the satellites we have around Earth, we would have noticed something of this DC current flow from the Sun by now, eh?" What is it that you guys fear so much? That everything you believe is wrong? Welcome to humanity...or reality, whatever you want to call it. "Hmm atmospheric electric circuits. Can this be?" Sometimes they are really powerful and go by the moniker of "lightening". I really do not understand (nor do I wish to so no explanation necessary) as to why certain types rail against evidence and observations that have clearly defined mechanisms behind their manifestation when they could, instead, accept the enlightenment that comes with new understanding. These are the guys still wanting to throw virgins into the volcano to prevent it from erupting while the rest of the population comes to realize you can't plug a lava tube with a 90LB human. Keep up, 691! The current is going INTO the Sun! Still invisible and undetectable, though. You ridicule because you claim that the current is "invisible and undetectable" yet we see the expected results from this phenomena so we "know" it must exist. Wait... are you describing dark matter? By having zero sensible scientific mechanisms, and no evidence whatsoever? Yep, going well, isn't it? The movement of plasma, neutrals, and electric charges within electromagnetic fields and interacting with charged bodies which absorb, store, and discharge the EM energy that travels through them is not a "valid scientific mechanism". Alrighty then! De Nile is in Egypt, you however reside at intersection of denial and willful ignorance. yet we see the expected results from this phenomena so we "know" it must exist. Typical double standard applied by the DM/BB religionists. The PDF is also available. And thanks again for that link. No, we don't see it. The Sun is powered by nuclear fusion. Show me evidence to the contrary. And dark matter can be detected, and has been, due to its gravitational effects. Errr, what is storing and discharging anything? Sorry, you are making crap up, as usual. Errr, what is storing and discharging anything? Really? And what are they doing? Absorbing, storing, and discharging electromagnetic energy. What is absorbing energy? What is discharging, from where, to where, and what is the evidence for it? "Sound of electromagnetic energy moving between Saturn, Enceladus"
Celestial bodies do not need divine inspiration... only a little rhythm. dark matter can be detected, and has been, due to its gravitational effects. The priori of a gravity based reality forces the assumption of Dark matter because the math does not work without it. An EM based reality does not need it. This priori of gravity was also Eddington's template giving us a thermonuclear core that defies all observable evidence. More math taken as empirical evidence by consensus stooges worshiping at the alter of authority and its non falsifiable gravity god. It's much more obvious than the plasma ignoramuses will acknowledge.